Presidential Realty Corporation is a Delaware corporation organized in 1983 that elected to be treated as a real estate investment trust for Federal and State income tax purposes. Presidential Realty Corporation was founded in 1909. The company began as a contractor that specialized in building theaters and movie houses in New York City. The company operated as M. Shapiro and Son during this period and built more than eighty cinema houses from 1911-1929. During the 1930’s, Presidential moved into the construction of institutional buildings and worked on such prominent projects as the American Museum of Natural History in New York. In the 1940’s the company began its move into residential housing, first by becoming a major builder of public housing projects after World War II and then as a developer of thousands of apartment units. Ownership and operation of rental housing became the prime activity of the firm in the 1950’s. Presidential had its IPO in 1961 and was listed on the American Stock Exchange. By 1973, Presidential owned property in twelve states and Puerto Rico, and had total assets in excess of $100 million. Over its history the company had interests in over 10,000 apartments units, in addition to ownership interests in office buildings, industrial properties and shopping centers. The Company's Class A and Class B common stock currently trade in the over-the-counter market under the symbols PDNLA, and PDNLB, respectively. In November of 2011, a new management team took over the operations of Presidential REIT and made a strategic investment in the company. The new team was led by Nickolas Jekogian, CEO of Signature Group Investments. The team set in place a strategic plan to reduce operating costs and to implement a growth strategy that focuses on the acquisition and UPREIT of high dividend yielding assets across the country. Presidential Realty Corporation, a publicly traded real estate investment trust, is working to develop a portfolio of high dividend yielding assets across the nation. We are looking for real estate private equity funds and owner/operators that would be interested in discussing their holdings and the potential merits of contributing them into the REIT in exchange for shares in an UPREIT structure. We are seeking partnerships with reputable operators to grow our portfolio throughout the United States. Umbrella partnership real estate investment trusts (“UPREIT”) are the primary vehicle for an owner of real property to convert ownership of one or more specific properties into an interest which can be converted into a publicly-traded security. In the basic UPREIT structure properties are acquired and owned directly or indirectly by the umbrella partnership. The umbrella partnership is the entity through which the REIT operates and collects all income from the properties. 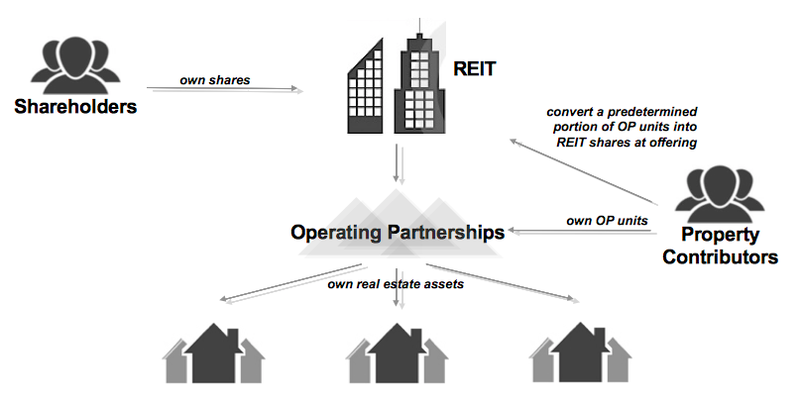 The REIT does not directly own any real estate properties in the UPREIT structure‚ rather it owns interests in the operating partnership by being both its sole general partner and one of its limited partners. In an UPREIT transaction‚ property owners contribute their properties in exchange for ownership units in the operating partnership (“OP Units”). Conversion from OP Units to REIT shares is considered a taxable event‚ so the investor may choose to convert over time‚ which enables the investor to incur any tax liability in smaller increments. Taxes: The owner does not recognize immediate gain on the transaction because the owner does not acquire publicly-traded stock in the REIT, but rather receives units in the operating partnership (“OP Units”). If the OP Units received from the operating partnership end up in the owner's estate, the ultimate recipients of the units will receive a stepped up basis equal to the value at death or the alternate valuation date and the inherent gain resulting from the UPREIT transaction will not be subject to capital gains or income tax. The tax deferral or avoidance, as the case may be, gives UPREITs a large advantage over cash purchasers. This is particularly true for individuals or entities which have a low tax basis and therefore the potential gain is substantial. Diversification: A transaction can be structured which enables the property owner to convert an interest in one or more specific properties into an interest in a larger and more balanced portfolio of properties held by the UPREIT. The portfolio is often diversified as to property type and geography and usually benefits from the economies of scale and management that a larger entity can offer. Liquidity: The UPREIT structure allows an interest in illiquid individual properties to become more easily saleable. Stock Appreciation: There is the potential for the stock in the REIT to appreciate beyond the value of the owners’ real estate contribution. This could potentially deliver higher returns than those achievable from the ownership of one or more specific properties. Please read these terms and conditions of use carefully, as they govern your use of the web site and your legal rights and obligations. By accessing or using this web site you accept and agree to be legally bound by these terms. If you do not agree to be bound by all of the terms, do not use the web site. We may make changes to these terms from time to time in our sole discretion, by updating and posting the revised terms on this web site, and specifying the effective date of the new version of the terms. Your use of the web site following the posting of a new version of the terms constitutes your acceptance of any such changes. Accordingly, when you visit this web site you should periodically check to see if a new version of these terms has been posted. This web site, and the information, content and services it makes available (which, collectively are referred to as the “Web Site”), is provided to you by Presidential Realty Corporation, a Delaware real estate investment trust and its affiliates, subsidiaries and related entities ("Presidential" or “We” or “Us”). These terms and conditions of use (“Terms”) set forth the terms and conditions governing your use of the Web Site. You agree to use the Web Site solely for lawful purposes, and you agree that you shall at all times comply with all applicable laws, statutes, rules, regulations, ordinances and the like applicable to your use of the Web Site. We grant you a nonexclusive, nontransferable, revocable, limited license to view, download, copy, and print content retrieved from the Web Site only for your personal use. Except to the minimum extent otherwise expressly permitted under applicable law, you may not use any content available via the Web Site in any other manner or for any other purpose without the prior express written permission of Presidential. Any unauthorized use of any content from the Web Site may violate copyright laws, trademark laws, privacy laws and/or other laws or regulations. Any forward-looking statements contained on the Web Site are intended to be made pursuant to the Safe Harbor provisions of the Private Securities Litigation Reform Act of 1995. The words "believes," "expects" and "anticipates" and other similar expressions which are predictions of or indicate future events and trends and which do not relate solely to historical matters identify forward-looking statements. Such forward-looking statements are subject to risk and uncertainties, which could cause actual results, performance or achievements of Presidential to differ materially from anticipated future results, performance or achievements expressed or implied by such forward-looking statements. Users are cautioned not to place undue reliance on these forward-looking statements. Some of the risks and uncertainties which may cause the actual results to differ from those projected by such forward looking statements are discussed under the heading "Risk Factors" in our annual report on form 10-K which may be accessed on the internet at WWW.SEC.GOV or through the Web Site. Many of these uncertainties and risks are difficult to predict and beyond management’s control. Forward-looking statements are not guarantees of future performance, results or events. Presidential assumes no obligation to update or supplement forward-looking statements that become untrue because of subsequent events. This Web Site contains a variety of information and content, including: (1) copyrighted material, such as information, text, directories, graphics, photographs, illustrations, floor plans, maps, images, video and audio clips, sound clips, advertising and promotional materials, data, software, compilations, designs, graphical interface, and overall “look and feel,” (2) trademarks, logos, trade names, service marks, and trade identities, whether registered or unregistered (collectively the "Trademarks"), and (3) other forms of information and intellectual property (all of the foregoing collectively and individually are referred to as "Content"). All right, title, and interest in and to the Content available via the Web Site is the property of Presidential or its licensors, and is protected by U.S. and international copyright, trademark, patent, or other proprietary rights and laws. You may not copy or otherwise use any of the content except as expressly authorized by these terms. While we strive to keep the content that we post on the Web Site accurate, complete, and up-to-date, we cannot and do not guarantee, represent or warrant that any of the content on this Web Site is accurate, complete, timely or applicable to you. Presidential reserves the right, in its sole discretion, to modify or discontinue the Web Site, or any portion of the Web Site, without notice to you or any third party. We also may, in our sole discretion, refuse or restrict anyone from access to the entire Web Site or any portion of the Web Site. You understand and agree that the Web Site and all Content on it is provided on an “as is,” “as available,” basis “with all faults” and without warranties of any kind, either express or implied. To the fullest extent permitted by applicable law, Presidential expressly disclaims all warranties, representations, and undertakings of any kind, whether express or implied, including, without limitation, any warranties of title, merchantability, fitness for a particular purpose, and non-infringement. Some jurisdictions do not permit the exclusion of implied warranties, so the above exclusion may not apply to you. You may have other rights which vary by jurisdiction. To the fullest extent allowed by applicable law, you agree that Presidential is not liable to you for any loss or damages of any kind (including, without limitation, any direct, special, indirect, incidental, exemplary, consequential, economic, or punitive damages or damages due to lost profits), whether based in tort, contract, strict liability or otherwise including, without limitation, any loss or damages arising out of or in any way connected with or relating to your use of this Web Site or with the delay or inability to use this Web Site, or for any information, content, products, and/or services obtained through this Web Site, or otherwise arising out of the use of this Web Site. Any violation of these Terms (as determined by Presidential in its sole discretion) may result in restriction or termination of your access to all or part of the Web Site and may be referred to law enforcement authorities. No waiver of any of these terms shall be of any force or effect unless made in writing and signed by a duly authorized officer of Presidential. These terms shall be governed by the laws of the State of New York, the United States of America and international copyright laws. You agree to submit to the jurisdiction of the federal and state courts in the State of New York for any and all disputes, claims and actions arising out of or in connection with the information provided to you herein. These terms constitute the entire agreement between Presidential and you pertaining to your use of the Web Site and any information contained herein and supersedes any and all prior written or oral communications and/or agreements previously existing between us.